Over the June bank holiday, Flannigan’s Field opened its gates to the Fatima community. The popular community garden drew in a large crowd despite the weather turning nasty throughout the day. It all kicked off just past 2 pm, where, outside one could marvel at all the beautiful plants and vibrant vegetables, while listening to live music courtesy of Mick and the volunteers who make the project possible. Flannigan’s Field as you may be aware was featured last April, on your favourite online digital newswire the Fountain. It was so good that I decided to go back around and see all the old gang and meet some of their new recruits. The dome was transformed into a huge hive of activity as local children were taught to make “music makers”, a device that is put together using various art materials and wait for it, rice grains. The children kept their art as a souvenir of their wonderful day out. It was not just art in the dome however, as parent and children alike explored the world of botany up closes through the eye powered lenses of multiple microscopes. The idea was that the children as well as some adults could pick a flower bring it in and observe it at a molecular level. A few times the dome played host for gathering crowds as the rain decided it would try it’s best to ruin the day but it did not succeed. The dome itself comprises of seven levels with its own inbuilt staircase. The reasoning for this design was to enhance certain species of plants and flowers, which need various watering systems at certain heights. The local children were also given some pop, water and sweets to keep up their levels. Despite the turn in the weather there was a great turn out local residents know a good thing when they see one. Jamie Roche can be contacted on 085 1544482; he is currently one of the many people over looking this project. If you would like more information please contact him. There are a number of plots still available, if you would like one. You can either grow vegetables or flowers, and you will have the backing of a very talented team with rich resources in this field. The gang are requesting if you have any old garden tables, chairs, shed or shed contents, water features, or if you have any cuttings of plants, indoor or outdoor flowers, seeds, bulbs, etc you no longer need Flannigan’s Field would greatly take them off you, as they need more plants and flowers. The Dome is also being used as a botanical nursery and one of its many jobs is to oversee the planting of seeds before they go out into the garden. In the dome you will see various old objects including an old bath tub having been recycled and reused as a tub chair. There is plenty of items been recycled and been re used. One must go down and have a look. The field is open most of the week from 10 am to 4 pm but do phone in advance. 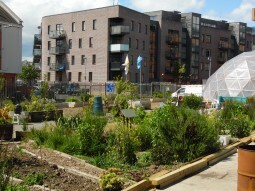 Flannigan’s Field have only been up and running a few years and has already won various awards, including Gardner Of The Year going to local volunteer Mick, they also have a number of awards from Dublin City Council. We wish Flanagan’s Field the very best in the future. To find Flannigan’s Field if you are coming from James Street Area, go to the F2 Centre Fatima, head down to Ruben Street, and you will see the dome, or the field. 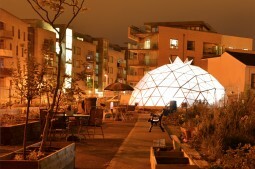 The Dome can be seen from either Cork Street or James Walk.